"It's alive, it's alive, it's alive! It's alive!" An iconic product of mad science, the creature has lumbered through scores of films and TV series, monstrous yet also pitiful. In the original 1818 book by Mary Shelley, Victor Frankenstein creates the monster, then, repulsed by his creation, immediately throws it out. Later, it returns and demands that Victor make it a wife. He agrees, then reconsiders and destroys the half-completed bride. The monster retaliates by killing Victor's best friend and threatening to kill his wife, should he ever marry. Victor immediately marries his adoptive sister, who is also his cousin, Elizabeth, who is promptly killed. Victor then chases the monster into the Arctic, where the weather kills him. The monster then goes off and kills himself (or at least he says that's what he's going to do). Few of this book's tropes were original—most were commonplace in Gothic novels of the eighteenth century—but they provide the oldest examples that are still widely read today. In it, the monster is created a blank slate, but is driven to evil by the way society mistreats it. Grave Robbing to get the parts for the monster. Victor's death at the hands of his creation. The "It's Alive!" quotation above. The "standard" appearance of the monster, usually consisting of a square head, greenish skin, enormous proportions, a scarred forehead, and bolts (actually electrodes) on either side of the neck. (To contrast, the most monstrous features of the novel's creature were his proportions and his jaundiced, soulless eyes.) Nowadays, this is a Discredited Trope. In the early films, the monster is evil because a criminal or damaged brain was used. Modern films and TV series often revert to the original idea, depicting the monster as an innocent trapped in a monstrous body, unaware of the damage he can do, rejected by a cruel world. When it starts out as an Evil Minions, it often does a Heel Face Turn. Don't use "Frankenstein" to refer to the monster. His name is Adam, at least according to readings given by Shelley during her lifetime. In the text of the book itself, though, he is generally referred to as "the creature". Part of the classic Monster Mash with Dracula, Mummy, and the Wolf Man. Compare also with the Golem. No such inventory is complete without the pastiche commercial Mascot Frankenberry. The real monster has appeared in a few commercials, both in cartoon form and with stock footage from Boris Karloff's movie. Soreike! Anpanman has Frankenrobo, which is a robot form of a Frankenstein's monster. Nobuhiro Watsuki (creator of Rurouni Kenshin and Busou Renkin ) made a one-shot called Embalming: Corpse and Bride. The main character is a monster called John Doe, and other monsters are the bad guys. A modified version with new main characters (but with John lurking in the background) is now running under the title Embalming: The Another Tale of Frankenstein. The premise of both is that Frankenstein's notebooks survived his death, and a thriving underground corpse-raising industry has resulted. Speaking of Busou Renkin, that series has a character who has traits of both the good doctor and his creation- not as seen in the movies, but as presented in the original novel. The character Victor is a human alchemist-turned-hommunculus who is unstoppably destructive (against his control), and is a highly intellectual Tragic Monster. In Soul Eater Dr. Franken Stein (First name Franken, last name Stein) is a (barely) good guy who literally has a giant screw loose in his head; he constantly is tightening it. Obsessed with vivisection (he has taken his own body apart and stitched it back together), the very concept of insanity, and the nature of knowledge of man in respect to God; he's an amalgamation of Frankenstein's Monster and Dr. Frankenstein himself. Being clever, the writers eventually give him a partner named Mary. Stein has had his own test-subject in his former Weapon, Spirit Albarn (himself descended from people experimented on by the witch Arachne). Franken also frequently expresses desire to cut up/dissect various characters, including child god Death the Kid. Which, given his issues with gods, is something that might be worth keeping an eye on. Maybe. In the 2003 anime version of Fullmetal Alchemist, attempts to revive the dead with alchemy results in Homonculi, Frankenstenian monsters with special powers. Several of these monsters also feature the same kind of pathologies and relationships with its master as Frankenstein's original monster. In Dragon Ball, Goku befriends the Red Ribbon Army's Android #8, who was an obvious reference to the Monster. Strangely enough, he only plays a bit part in DBZ, although several other androids in the same line show up and play major roles in the storyline. The Mariages from Magical Girl Lyrical Nanoha Striker S Sound Stage X. Also known as Corpse Weapons, these are mass-produced artificial soldiers created from corpses, courtesy of the technology from Ancient Belka. Franken Fran has... well, Fran. She's what would happen if Frankenstein had made a Cute Monster Girl and sent it to medical school. While skipping ethics class. There's a 1981 anime adaptation of Shelley's original novel. The monster never gets beyond inarticulate grunting, there's a poorly executed Christ metaphor, and to cap it all off, the ending is pure Trauma Conga Line as the monster, realizing that he's hurting people, throws himself off a cliff in front of the little girl he befriended. As she's mourning him, her father, one of the people who persecuted the monster, shoots himself. Poor little girl. The best place to find this is the Anime Hell panel of several American conventions. Junji Ito has done a manga adaptation. With his signature artistic style, it's quite creepy and notable for following Shelly's original story very faithfully. Magic the Gathering tends to do this to the tougher zombies that you can play that aren't zombified version. Not to mention the monster himself. The new Innistrad set takes this idea and runs with it with their Blue Zombie cycle. Skaab and Stitched creatures are made from the combined corpses of various other creatures, and this is represented in-game by how you must remove a number of creatures from your graveyard as an additional cost to summoning them. To drive the point home, the card Rooftop Storm, which resembles a mad scientist's laboratory, makes all zombies cost 0 mana, but you still need bodies to play them. The latter of the two title characters in the comic book miniseries Doll And Creature is essentially a '50s greaser version of Frankenstein's monster from a freaky future world. Doll is a human woman, but she has the classic Bride of Frankenstein two-tone beehive hairdo. Appears as a (titanically Badass) hero in Grant Morrison's comic Seven Soldiers of Victory. The name issue is resolved by stating that he's deliberately taken Dr. Frankenstein's name as his own. The Bride also features, not just with the classic hair-do, but also with an extra pair of arms. He goes on to get a Flashpoint miniseries and a subsequent ongoing, both written by Jeff Lemire. Incidentally, in the former he ends World War II by killing Hitler. "All in a day's work...for FRANKENSTEIN!" A teenaged version of this character, Young Frankenstein, was briefly a member of the Teen Titans. In a Howard the Duck comic from the '70s, Steve Gerber revived the story with two twists. One, the Dr. Frankenstein figure was a little girl. Two, the monster she created was a seven-foot walking gingerbread man. Little Gloomy has Frank, who is, well, the Monster. He's slightly dim (slightly), and parts of him occasionally fall off and need to be restitched. He's actually one of the main characters, with a crush on Gloomy herself (though eventually he gets a "bride", Shelley). The 'actual' Frankenstein's Monster has showed up many times over the years in comic books, but DC's Swamp Thing also had The Patchwork Man, a normal man who was 'repaired' (badly) by Swamp Thing's enemy the Mad Scientist Anton Arcane. Adding to the tragedy, the unfortunate in question was Anton's brother, and the father of Swamp Thing's human girlfriend. Volume 2 of Alan Moore's The League of Extraordinary Gentlemen comic book includes a "bonus" world almanac of fantastical places, which reveals that after jumping off the ship at the end of the original novel, the creature found his way into Toyland, and married the queen. Bizarro, in incarnations where he is an imperfect clone of Superman created by Lex Luthor, such as on Superman the Animated Series, is pretty much Frankenstein's Monster. Like Dracula, Dell Comics turned Frankenstein's Monster into an Honest to Goodness Superhero. In Fables, Frakenstein's Monster was animated by Nazis during World War II. Bigby fought the monster (in a reference to the 1943 film Frankenstein Meets the Wolf Man) when he and a squad of Allied soldiers stormed the castle where the experiment was being performed. The Monster's still-animated head is kept in the business office in the Woodlands building where Bigby chats with him from time to time. He often has phantom thirst and is given drinks by Bufkin though the last time this happened, the bottom of his cage rusted out. In the Batman Elseworlds comic Castle of the Bat, set in 1819 Germany, Bruce Wayne's desire to bring back his father leads him to play out the role of Dr. Frankenstein: He constructs a patchwork body from corpses, and places Thomas Wayne's brain inside. Then he injects the reanimated Thomas with "essence of bat" to fix his brain injury, causing Thomas to mutate and gain the head of a bat. Superman himself in one of the Elseworlds titles, which retells the tale of Frankenstein, but with Lex as the doctor, Superman as the Monster, and the story is changed up a bit. Marvel 616 has had several Frankenstein's Creatures walking about, though none were the actual original product but homages (By in universe scientists.) One was a Hulk analogue (Makes sense seeing as Hulk seems like a Dr. Jekyll/Mr. Hyde/Frankenstein's creature combi.) and one led the Howling Commandos. In Dark Reign, Daken, son of Wolverine, killed Frank Castle, The Punisher, and he was resurrected as Frankencastle, who led the new Monster Squad, with Morbius the Living Vampire and Man-Thing, into combat. There is a Frankenstein Monster in the Marvel Universe; but his creator's descendants have created several more. Fantastic Four: True Story, in which Marvel's first family was trying to save the world of fiction from Nightmare, featured the monster from the original book as one of their allies. Later, when the team had been stripped of their powers and attacked by Dracula, Ben was trying to summon him for help. Ben Grimm: Actually, It's not so hard to imagine Frankenstein fighting Dracula. Frankenstein: Dear God, what are these monstrosities? Probably nothing I can deal with. Ben: Ups, my mistake. I mean Frankenstein's monster fighting Dracula. Surely this troper can't be the only one that noticed a comparison between the monster and Marv from Sin City. Both hulking near indestructible abominations who go to extreme lengths for love, and were 'created' in a sense. In a Pre Crisis story, Superman battled the Monster (and Dracula) though they may not have been the genuine creatures but rather creations of a dead writer's mind. The Phantom Stranger helped. Len Wein's Spawn of Frankenstein feature that ran as a back-up feature in The Phantom Stranger. Pvt. Elliot "Lucky" Taylor of the Creature Commandos in The DCU - Lucky barely survived stepping on a mine. He was stitched back together against his will so he resembles the Frankenstein monster and has damaged vocal cords. The 1931 original (Number 27 on Bravo's One Hundred Scariest Movie Moments). The 1987 Universal homage/pastiche film The Monster Squad features a Gentle Giant version of the monster who is forced into the role of an Evil Minions, befriends a five-year-old girl, and does a Heel Face Turn. This might be an homage to Paul Wegener's The Golem in which the titular clay being befriends a little girl who, soon afterwards, accidentally kills him by removing the magic star from his chest. Both Frankenstein and his Monster figure prominently in the classic 1960's Rankin-Bass stop-motion feature Mad Monster Party. The portrayal is very much based on the earlier movie versions. Young Frankenstein is Mel Brooks' send-up of the classic monster story. For one, the Monster has his head attached with zippers instead of bolts. Van Helsing featured Frankenstein's creature as a mixture of the 1930s Karloff version (his appearance, except with more mechanical parts) and Shelley's far more eloquent creation. He was also a sympathetic Gentle Giant created as part of Dracula's Evil Plan to resurrect his born-dead vampire children. What's more, he's just called "the monster" or "the creature". Yes. Stephen Sommers got something right. Also, the hero (or his Detect Evil power) is Genre Savvy enough to keep an open mind when first meeting the so-called monster rather than set up the expected Let's You and Him Fight scenario. Tim Burton's early short film Frankenweenie is about a young boy who revives his pet dog. He will also direct The Remake. The title character in The Rocky Horror Picture Show is a Charles Atlas-ified version of this. The Kaiju film Frankenstein Conquers the World has the immortal heart of Frankenstein's monster get caught in the bombing of Hiroshima, growing first into a child-like body with the familiar forehead before becoming a massive giant in a caveman-ish outfit that fights the firebreathing dinosaur monster Baragon. Its sequel, War of the Gargantuas, has the title monsters growing from pieces left behind in the forest and in the sea, resulting in the kaiju equivalent of Cain and Abel. Saturn 3 transports the whole premise of this into space with Hector, who looks and acts like the creature right down to the mad scientist handler and mute pursuit of the Shallow Love Interest. The title character of the horror film May, after getting picked on and rejected one too many times, comes to the conclusion that nobody is perfect—only parts of them are. So she decides to build a "perfect friend" by killing people (mostly her friends and co-workers) and taking the parts of their bodies that she finds to be "perfect." She names her creation Amy, and she really does come to life at the end - unless one interprets it as being all in May's head. Kenneth Branagh directed and starred in an incredibly faithful version in 1994, featuring Robert De Niro as the monster. Frankenstein Unbound is a 1990 movie directed by Roger Corman - and is pretty decent, in an episode-of- The Twilight Zone -kind of way. The premise is that Shelley's book was an account of real events that took place ... mostly ... but with the added bonus of a weapons scientist from Twenty Minutes Into the Future appearing in the story, whose story arc parallels that of Frankenstein himself. The killer in the Slasher Movie The Funhouse dresses as The Monster to hide his deformed features. The 1985 movie The Bride is a spinoff starring Sting... yeah the one from The Police... and Jennifer Beals as Charles Frankenstein and a female creature Eva respectively. Carry On Screaming includes a pair of Frankenstein's monster style creatures who do the bidding of the resident Mad Scientist. The horror films Pieces and Resurrection involve characters attempting to imbue life into a mish-mash of body parts they've collected and crudely fused together. The Curse of Frankenstein, a 1957 Hammer Horror adaptation, starring Peter Cushing as Frankenstein and Christopher Lee as the monster. Frankenstein's Monster is one of the eight wrestlers in Monster Brawl. The Trope Namer and Ur Example: Mary Shelley's Frankenstein. David Bischoff's novel Mandala featured similar constructs known as "helter-skelters." They differ in being quite articulate, no bigger than the human average, and in being an odd mix of buffoonery and pathos. Subverted in "Dean Koontz's Frankenstein" novels, in that both the creature and Dr. Frankenstein have survived to modern times. Both characters have lived all over in the interim and taken new names; the creature calls himself Deucalion, while the Doctor is now known as Doctor Helios. In addition, Dr. Helios spent the intervening time figuring out what went 'wrong' with his first creation and has decided to replace all of humanity with his custom-designed 'much-better models'. Deucalion has decided to oppose him, aided by a pair of local police detectives. The only signature feature that Koontz has added to all of the synthetic beings he has made (back to and including the original) is the presence of two hearts. Deucalion has become The Atoner, while Victor is pretty much a monster himself. This reversal of roles is lampshaded. Fred Saberhagen's novel The Frankenstein Papers reveals that Frankenstein's monster was actually an alien observer who was curious about the deranged doctor's efforts, and who suffered traumatic amnesia after being shocked by the doctor's equipment while investigating the rotting patchwork Frankenstein had assembled; after destroying the original creation while convulsing, the alien passed out on the workbench and was mistaken for the newly-revived construct by the literally-mad doctor. Having no other memory, the alien accepted Frankenstein's explanation of his origins. In The Edge Chronicles "Curse of the Gloamglozer", the titular monster is revealed to be one: an unfortunately successful attempt at creating life from primal life particles. In Frankensteins faster ("The Aunt of Frankenstein") and its sequel by Allan Rune Pettersson, the aunt of Dr Victor Frankenstein takes up residence in his old castle, determined to get rid of the shame that silly boy has attached to the family name. Her plans end up including resurrecting the Monster, but in a way that won't cause a scandal. This young adult novel is, as you can understand, an Affectionate Parody of old Hammer Horror movies, including Monster Mash—both Count Dracula and Larry Talbot play a role. There's a short story about a father who tries to recreate his son by taking back the body parts the boy donated after dying. Scraps, Igor's "mixed-breed" terrier in Carpe Jugulum is a Frankenstein's Dog. Also alluded to in Thief of Time, when Jeremy Clockson comments that some people really come alive in thunderstorms, and Igor replies "Ah, that wath when I worked for Baron Finklethtein." Chopfyt in The Tin Woodsman of Oz is arguably a Frankenstein's Monster, being constructed from the detached human bits of both the title character and the Tin Soldier. Fate/Apocrypha features a female version of Frankenstein's Monster, fully subject to the Fate universe's signature Artistic License. Agent Franks of Monster Hunter International is a body built by alchemist Conrad Dippel which wound up becoming a host for a demon. Luckily for humanity this fallen angel is the one seeking redemption. He's super strong (a fist fight between him and a guy who wrestled a werewolf to death is one sided), nigh invulnerable, immune to infection by monsters, can be rebuilt if not totally destroyed and reasonably intelligent but his wisdom and charisma are terrible. The Munsters featured a Gentle Giant version as a Bumbling Dad. Fantasy Island: Anne Frankenstein appeared in one episode. The Doctor Who story "The Brain of Morbius" was a clear Homage. And a robot version of the monster appeared in one episode of The Chase. The X-Files episode "Post-Modern Prometheus" was a parody right down its title, which was a play on the original book's subtitle. Adam in Buffy the Vampire Slayer. Adam is also a Cyborg, since he had machine and computer parts. There was also a one-shot version of this plot in "Some Assembly Required". Kamen Rider Kiva has Dogga/Riki, the Last of His Kind of an entire race of Frankenstein's Monster-like beings with immense strength who feed on human souls. Thanks to a pact with the hero's father, he can loan his power to Kiva, turning Wataru into a Mighty Glacier who grunts rather than speaking, swings a giant hammer, and has a lightning theme (matching up with the method of the Monster's creation). In the Weird Science episode, "In Search of Boris Karloff," Lisa takes Wyatt and Gary into the world of Frankenstein. In this version, the Creature (specifically referred to as not Frankenstein himself) lives with his creator. He is portrayed as quite dimwitted and prone to anger (the latter a result of constantly being mistreated), but he is a Gentle Giant to Lisa, as she showed him nothing but kindness. The Criminal Minds episode "There's No Place Like Home" featured a lunatic who was convinced he could bring his older brother back by making him a new body, and exposing it to a tornado (the thing that killed his brother). Frankenstein is brought up by Reid when they finally discern the motive. The Frankenstein Monster is the Monster of the Week in the first Halloween Episode of Mighty Morphin Power Rangers. The Insane Clown Posse song Mad Professor features Jay creating Shaggy this way because he is lonely. Abra Cadaver from The Wizard of Id. In Mortasheen, Victrossus is definitely created with this trope in mind. It deals with the "brain" aspect a bit interestingly, as Victrossus is normally mostly brainless, with a neural "ladder" controllign tis basic functions. But, it is meant to have a brain put in it, and enslaved by said neural "ladder" for their master to control it for their whims. In the role-playing game Promethean: The Created, artificial lifeforms made from corpses are called Prometheans, after the Titan who gave mankind the gift of fire; their goal, and thus the player's goal, is To Become Human—a possible (but exceedingly hard) task. One Lineage is called the Frankensteins, and the first of their number is explicitly identified as Victor Frankenstein's monster (aka. Adam Frankenstein, aka. the corebook's narrator 'Mr. Verney') (which still exists in this world). This is all derived straight from the original novel, to boot - the alternate title to Shelley's classic is The Modern Prometheus. Dungeons & Dragons have creatures known as Flesh Golems, which are effectively Frankenstein's Monsters. Actually, Flesh Golems are near mindless, so they don't fit this trope as well as one would think. A closer fit would be the Blasphemes, stitched together undead with full sentience. In Ravenloft making any golem is a bad idea—but making these is easier and mad scientists do, frequently out of desperation. The monster Adam is a very close copy of the concept, drawing more upon Shelley than movies. However, the monster is here explained as a case of its creator having been punished by the gods for seeking to create life, and as such the creature was Exclusively Evil, despite its vigorous claims to the contrary. In the setting Masque of the Red Death the actual monster of Frankenstein is used as one of many villains. A throwaway line in the corebook for Don't Rest Your Head indicates that the original has become one of the Nightmares. In Halt Evil Doer, Frankenstein's Monster serves as a Public Domain Character Captain Ersatz of the Incredible Hulk ... with Victor as a sort of evil Bruce Banner. Frankenstein has been adapted into a Broadway musical. There is a straight play called After Frankenstein that tells of the confrontation between the creator and the monster in the Arctic. There is also a musical adaptation of Young Frankenstein. Frankie Stein is the daughter of Frankenstein's Monster and his Bride in Mattel's franchise, Monster High. In Fable II the quest "Love Hurts" is an allusion to Victor Frankenstein, as the gravekeeper, Victor, is trying to bring Lady Grey back to life; this is further reinforced by the name of the dungeon in the proximity of the mansion. The name of the dungeon is "Shelley Crypt"; Mary Shelley was the author of Frankenstein. Victor von Gerdenheim from Darkstalkers is the monster with a different name and story, as well as the ability to generate electricity. Victor sets out to resurrect his creator's daughter Emily, and in the end does so by sacrificing his own life to "power" her. His name could be considered an inversion of the I Am Not Shazam issue the monster often faces. A common boss (later on a Degraded Boss) in the Castlevania games is the Creature (almost never called Frankenstein). He usually has electricity based powers and brute strength, although the Portrait of Ruin version has one with a machine gun and rocket launcher hidden in his arms. It gets confusing when you note the dates of some of the games he's appeared in: for instance, Castlevania is set in 1691 and Symphony of the Night in 1797. You know except for the fact that Victor 'discovered' how to animate corpses, and did not invent, which makes it sort of a brilliant moment considering that the 'discovered' secret could easily have been possessed by Dracula, explaining his undead armies. In Operation Darkness one of your squad members, Frank Gaunt, is the creature himself. He's intelligent, well-spoken, and can summon giant fists of lightning to come out of the sky to blow up Panzer tanks. Oh and the Doctor's not left out either, his descendant is helping the Nazis develop an atomic bomb. In Final Fantasy VII, Vincent Valentine's second Limit Break Death Gigas transforms him into a form strongly resembling Frankenstein's monster, which fights with strong physical blows and a lightning-based attack. Three installments ago, Final Fantasy IV had a Frankenstein-esque boss in one of the Towers. In Warcraft games, undead abominations are huge lumbering creatures made from stitched up corpses and reanimated with dark magic. In World of Warcraft there are other similar creatures as well. One particularly noteworthy is Thaddeus, a boss in the necropolis Naxxramas, who looks a lot like an enormous Frankenstein's monster and has lightning-based powers (the gimmick of the fight is his ability to "polarise" the raid, giving half of the players a positive charge and the other half a negative charge. Going too close to an opposite charge results in an explosion). A Frankenstein's Monster is the boss of the Dungeon level in MadWorld. Franky, as he's called, tends to be That One Boss—he's huge, can electrify himself, is a Lightning Bruiser, the ground level is covered in water, you have to manually unscrew five huge bolts in his back to beat him, the timing to pull that off is damn tricky, and he can heal himself repeatedly. The Elder Scrolls IV: Oblivion's Shivering Isles expansion introduces the Gatekeeper, a monster made of stitched together body parts given life through magic, with it's "mother" Relmyna Verenim playing the role of Frankenstein. The Magician in the House of the Dead series. In the third installment, Curien himself becomes one. Arisen from Allods Online. Corpses reanimated by inserting cyborg implants in them (their arms from slightly above the elbows down to the hands, their legs from slightly above their knees down to the feet and possibly the head too since they use a mask (and there must be a way to carry their soul in a dead corpse, as they have presumably still have the soul of the person the corpse belonged to). These aren't outright evil (apart from the Tep), as they basically have human souls, but on dead + cyborg bodies. Frankenstein: Through The Eyes Of The Monster, a first person adventure game that puts you in the shoes of the monster itself. The monster is one of the two protagonists of the Monster in My Pocket Licensed Game. Girl Genius has the entire class of artificial people made by Mad Scientists sometimes from scratch or corpses and sometimes by modifying normal humans and/or other animals, called "constructs", with most of them having at least a passing, and sometimes a very close, resemblance to the original Frankenstein's creation. The two constructs that raised Agatha were named Adam and Lilith Clay (in reality, Punch and Judy). (In case you don't get it, in some versions of the creation myth, Lilith was the first wife of created-out-of-clay Adam, deposed because she preferred the female superior position. It seems that "Lilith" in this case refers to Lilith being the equal of her husband rather than submissive as Eve was). Some of the Jägermonsters (a Proud Warrior Race Guy of "modified human" constructs) resemble The Creature closely, with greenish skin and intimidating proportions. Others sport claws, fangs, horns, and varying degrees of hair, and an assortment of skin tones. Krosp, a talking cat with the brain of a general... or most of it, anyway. Klaus Wulfenbach himself has a lot of nasty stitches. Implied to have been both brought back after being messed up and heavily modified (nearly impossible to kill or incapacitate, superhumanly strong). In the Flashback Universe, the monster's "son," Victor, is part of the League of Monsters. And the monster himself ended up becoming Paladin, an Alternate Company Equivalent of Captain America. No, really. Gwynn's "Clutter Monster" from Sluggy Freelance, a magical golem created out of all the clutter filling her apartment. Sociopathic Hero Unity from Skin Horse. In Bibliography, one of the five Main Chapters is mentioned in passing to be the Frankenstein Codex, in charge of surgeries at St. Jerome's hospital. One of the main characters of Frankie and Stein is one of these, created by the other. In "The Superfriends Meet Frankenstein", Dr. Frankenstein transferred the powers of Batman, Superman, and Wonder Woman to a "featureless target body". Even though Batman's abilities can hardly be called "powers". In Gargoyles, Demona and Xanatos use a set-up much like the classic Mad Scientist Laboratory where they use both magic and technology to create the cyborg Coldstone out of the parts of three Gargoyles. When it moves, Xanatos screams: "It's alive, ALIVE!" then calmly turns to Demona and says: "I Always Wanted to Say That". The animated series Ben 10 revealed that Frankenstein's monster, along with werewolves, mummies, and ghosts were actually species of alien that sometimes visit earth—with Frankenstein's monsters being a species of extra-terrestrial cyborg. The titular character later gains the ability to transform into one. The alien in question, incidentally, is very true to Shelly's original portrayal, looks aside. He's fast and dexterous in addition to be strong and resilient, and he's extremely intelligent as well, being the chief organizer of the Big Bad's plot. In Transformers: Beast Wars, the character of Rampage doesn't fall far from the smarter and more vengeful incarnations of this monster, vengeful against those who cursed him with his freakish existence, against those who caged him like a beast, and driven by a cruel and sadistic nature, he frightens in a very Shelleyan way. This explains Rampage up to a point, but he seems to also just be a psychopathic sadist in his own right. He is vengeful and sadistic towards the main characters but he befriended Transmutate and was in mental anguish when it was destroyed. His comment to Blackarachnea ("I regret everything, my sweet") and his welcoming of death at the hands of Depthcharge (knowing it would kill both of them) also indicate that he isn't exactly happy with what he is and reacts to that with sadistic violence. Also, in the original 80s The Transformers show, there was an early 2nd season episode where Spike was mortally wounded, and his father Sparkplug and Autobot Mad Scientist Wheeljack decided the logical solution was to build a robot body out of spare parts and transfer Spike's mind to it. This eventually led to Spike wangsting out about being a "freak," and he went berserk and started shooting everyone. Just in case you didn't get it, the episode began with Spike watching a black-and-white version of Frankenstein, and referenced it several more times throughout. Frankensteins Cat is an animated series about Dr Frankenstein's first creation: a cat named Nine, stitched together out of nine different cats. Frankenstein's Monster is one of the good guys in Monster Force, referred to as "Franky". This is evidently sort of a family nickname, as the granddaughter of Dr. Frankenstein (Shelly Frankenstein) is also part of the team. 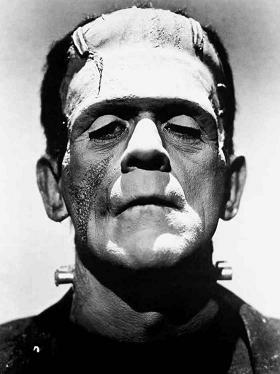 Frankie, one of the members of Drak Pack, was a descendant of the Frankenstein monster. In an episode of The Venture Brothers, Dr. Venture resurrects on of the Monarch's fallen minions and names the result "Venturestein". Venturestein is actually kind of scrawny, but he's got the requisite Hulk Speak, stitched-together head, and neck bolts. Time Warp Trio had the eponymous trio travel back to Lake Geneva in 1818, where they not only encountered Mary and Percy Shelley, Lord Byron and John Palidori, but also the Frankenstein's Monster himself (It Makes Sense in Context). The champion of Monster Truck Wrestling as revealed at the end of Monster Truck Mater is actually Doctor Frankenwagen's Monster. The Duck Dodgers episode "Castle High" has Dodgers doing everything by the book. Johnny Bravo fell for a Bride of Frankenstein-esque female in "Frankenbravo". By the end of the episode he's a Frankenstein monster too. Alvin and The Chipmunks Meet Frankenstein. A Universal Studios-style theme park hires Dr. Frankenstein to up the scare factor in their horror show, not realizing that he's brought real body parts to decorate. He immediately creates the monster, which breaks loose and runs away. He scares the Chipmunks at first, but then Theodore realizes he wasn't attacking and teaches him to be a good friend. Once they convince everyone else and teach him to talk, he's given a job at the park, and we last see him happily driving a tour trolley. The emmy nominated "The Monster Of Phineas-n-Ferbenstein" has Phineas and Ferb's ancestors creating a Frankenstein version of Perry. Igor has the title character create a giant female Frankenstein monster named Eva. Unfortunately for him she turns out to be good and wants to be an actress. Mary Shelley's Frankenhole has one that's fairly close to the book's version (not the Boris Karloff one though, as many characters point out). He's more like a mopey teenager than a monster though. Scooby Doo and The Ghoul School has Elsa Frankenteen, the daughter of Frankenteen Senior. Robot Chicken fell into the I Am Not Shazam predicament when a father had to deal with his daughter being in a relationship with Frankenstein. The father finally comes to terms with the pairing until he realizes she married Frankenstein and chased after the monster because he's Jewish. ↑ Well, 'Marie' actually, unless fan translations are consistently wrong. This page was last edited on 23 October 2018, at 01:40.